WASHINGTON – Amsterdam Falafelshop has reached a new rung on the ladder of success. The award-winning falafel franchise today announced that it has been named to the exclusive Fast Casual Top 100 “Movers & Shakers” list. 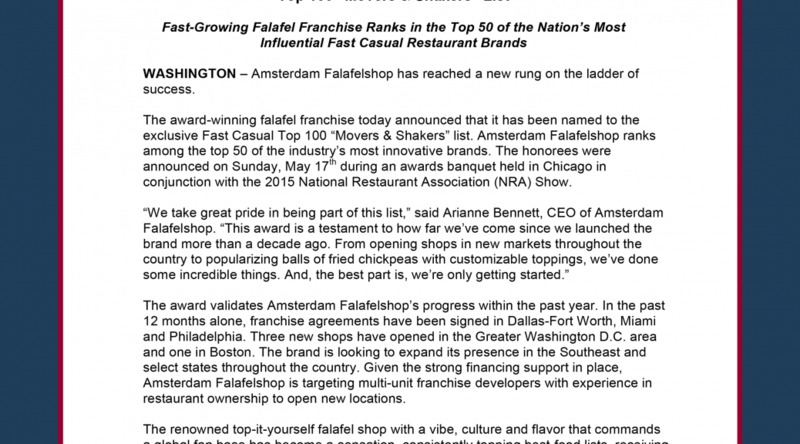 Amsterdam Falafelshop ranks among the top 50 of the industry’s most innovative brands. The honorees were announced on Sunday, May 17th during an awards banquet held in Chicago in conjunction with the 2015 National Restaurant Association (NRA) Show. The award validates Amsterdam Falafelshop’s progress within the past year. In the past 12 months alone, franchise agreements have been signed in Dallas-Fort Worth, Miami and Philadelphia. Three new shops have opened in the Greater Washington D.C. area and one in Boston. The brand is looking to expand its presence in the Southeast and select states throughout the country. Given the strong financing support in place, Amsterdam Falafelshop is targeting multi-unit franchise developers with experience in restaurant ownership to open new locations. The renowned top-it-yourself falafel shop with a vibe, culture and flavor that commands a global fan base has become a sensation, consistently topping best-food lists, receiving widespread food-critic acclaim and winning over the hearts of discerning customers who have made it a top restaurant on Yelp. In addition to serving fresh-made falafel sandwiches and Dutch-style fries [“frieten”], shops offer nearly two-dozen toppings for patrons to customize their falafel. This year’s list included 75 brands in which judges narrowed down from a pool of 900 nominations from FastCasual.com readers. Criteria included innovation, growth, social responsibility and overall contribution. The last 25 spots on the list went to the year’s most influential menu and technology trends as well as the industry’s most innovative marketing campaigns. Complete results of the Fast Casual Top 100 “Movers & Shakers”, including company profiles, can be found at http://www.fastcasual.com/whitepapers/fast-casual-2014-top-100-movers-shakers/. To learn more about Amsterdam Falafelshop, please visit http://www.falafelshop.com/. Individuals and groups interested in learning more about Amsterdam Falafelshop franchise opportunities should visit http://www.falafelshop.com/franchise-information. Since opening in 2004 in the heart of Washington, D.C.’s Adams Morgan neighborhood, Amsterdam Falafelshop has become a magnetic destination. The top-it-yourself falafel sandwich and Dutch-style fries shop with a vibe and culture tailored to meeting the taste and atmospheric demands of urbanites nationwide creates an unforgettable, unique experience in every community it enters. Shops retain a feeling of neighborhood independence amid a period of crucial franchise growth. With seven locations operating today and multiple units in development, plans call for an exponential increase in franchised sister-shops, adding dozens of Amsterdam Falafelshop franchise locations across urban centers nationwide. For more information about the restaurants, please visit www.Falafelshop.com. To learn about available franchise opportunities, click on the website’s “Franchise Opportunities” tab.